Lady Anne is a unique heritage vessel that has been chartered by U.K.-based River Cruise Line since 2001. 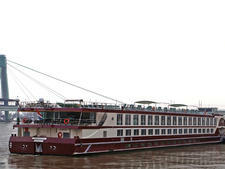 The oldest ship sailing on the Rhine, it was originally built as a barge in 1903, and was converted into a 100-passenger ship by previous owners in 1963. It has been owned by Dutchman Wido Arts, who is also the captain, since 2002. Offering five- to 10-night itineraries, the ship caters to mature British passengers looking for affordable cruises with a focus on old-fashioned home comforts rather than luxury amenities. Cabins are small and basic, and passengers choose to spend most of their time on excursions or relaxing in the cosy, panoramic lounge. The fare includes return coach travel from regional pickup points and ferry crossings from Dover, Hull or Newcastle. Shore excursions are not included, providing the flexibility for passengers to decide how much or how little they want to do. The 19 crew members, several of whom have worked on Lady Anne for many seasons, are helpful and attentive, and with 100 guests (almost half the capacity of larger river vessels) passengers get to know each other very quickly. Captain Wido is married to purser Jana Arts, which adds to the friendly, family atmosphere. The River Cruise Line caters to the British market, in particular budget-conscious travellers who enjoy coach tours. Lady Anne's passengers are mostly retired, aged 65 and over, with some sprightly passengers who are well into their 80s and beyond, and the ship enjoys a high level of repeat business. The majority of passengers are couples, often travelling in groups, plus a handful of solo passengers attracted by no single supplements on selected sailings. The dress code is informal, with a request that "no shorts or denim" are worn during dinner. On captain's party night, some passengers do dress for the occasion, but this is optional. Tipping is discretionary and tips can be paid in cash in the envelope provided on the penultimate day. The River Cruise Line recommends €5 per person, per day, which is divided equally between all crew members. It does not include the cruise director, cruise manager or coach driver, who you may want to tip separately. The onboard currency is the euro.